I’m not sure there is a more iconic fall treat than a caramel apple. They all of a sudden pop up in grocery stores around this time and then disappear by December. 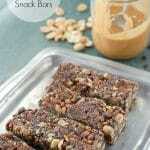 Such an elusive treat and so easy to make at home! 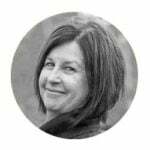 One year after my kids returned from Trick-or-Treating we were doing the compulsory sort through their candy bags discarding anything open, and passing gluten-filled treats to my husband. One house in our neighborhood had given out caramel apples enclosed in hard plastic from the store. Ordinarily we chuck anything fresh unless it’s from a neighbor we know personally. It’s sad really but not knowing the source, I’m a conservative. I was vacillating on these apples until I noted an expiration date; of a year prior. Yuck. They went into the trash. It was then I decided to investigate making caramel apples from scratch. 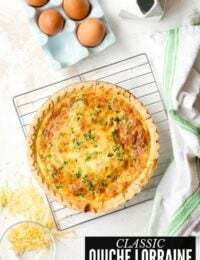 As with many foods we tend to buy around the holidays, making them at home turned out to be pretty easy. 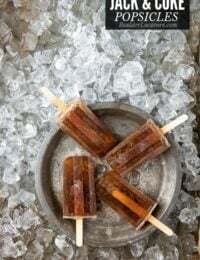 Making the caramel is not difficult but takes some attention in monitoring the temperature to ensure it reaches a cooking stage of being soft and pliable enough for dipping without over or under cooking. A trusty candy thermometer ensures that. I love variety and decided for the batch I’m sharing today to dip them in different candies and nuts. 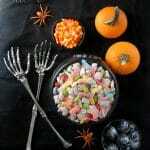 It would be a great project for after Halloween too to use up some of the candy. Many candies can work for this. Smaller pieces adhere more easily so I used bite sized Butterfinger and Snickers bars and chopped them up. M & M’s and similarly shaped candy (Reese’s Pieces for instance) work great. 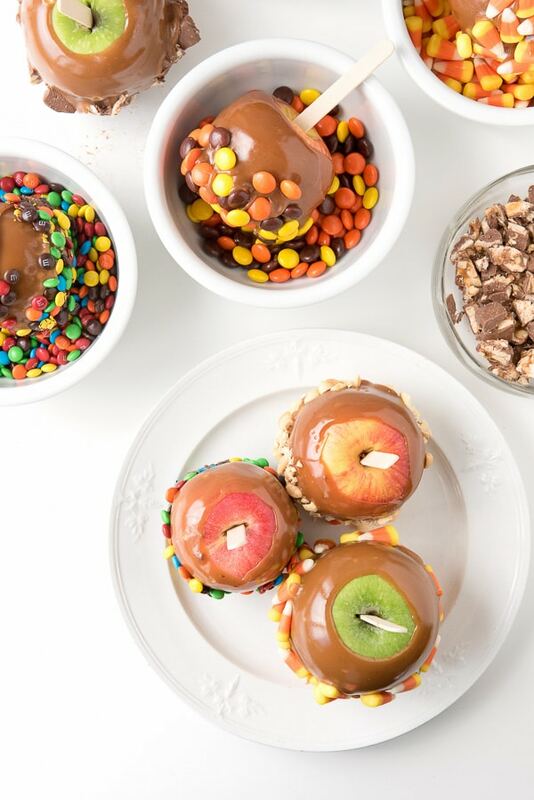 Pick your favorites and create a caramel apple sampler plate with slices of each to serve! 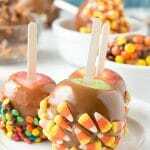 Caramel apples are a perfect fall treat and these are especially exciting being rolled in a variety of candy. The caramel is so full-flavored and only requires patience and stirring until it reaches the right temperature to swirl the apples.Granny Smith apples are the traditional choice for caramel apples but truthfully in my household they are not always the favorite variety. 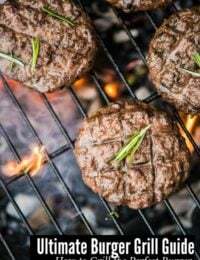 Often the tartness is not accompanied with a depth of flavor making them a bit flat tasting. I used a variety of red apples in addition to some Granny Smith and they all were delicious. Remove the apple stems and insert the sticks into the tops of the apples. Be sure the apple is sturdy on the stick. 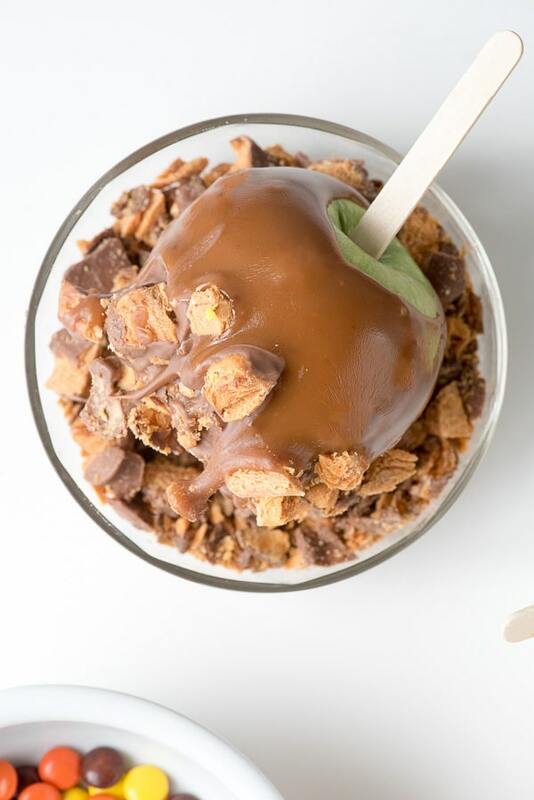 Add the candy and/or nuts to individual medium-size bowls to allow plenty of room to dip and roll the caramel apples. Line a baking sheet with wax paper and spray with non-stick spray (for the dipped apples). 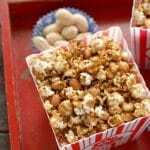 In a large saucepan over medium heat combine the butter, brown sugar, corn syrup and salt. Stir together and allow to come to a boil. Equip the pan with a candy thermometer. Stir in the condensed milk and allow the mixture to keep cooking until it the mixture reaches 248 degrees (the ‘firm ball’ stage). Remove from heat and stir in the vanilla extract. Holding an apple by the stick, inset the apple into the hot caramel and twirl the apple to fully coat. Hold apple above the saucepan allowing excess caramel to drip back into the pan. Note: tipping the saucepan at a 45 degree angle may assist quick coating of the apples as well. Immediately place the dipped apple into one of the candy or nut bowls, rotating the apple around to cover the surfaces desired. Place the coated apple on the lined baking sheet to harden. Repeat until all the apples are coated. Note: should the caramel begin to set making dipping the apple difficult, allow the pan of caramel to sit over low heat for a few minutes to liquefy it again. Storing and Eating Caramel Apples: Ideally the apples would be eaten after making them however they may be wrapped in plastic wrap and stored in the refrigerator for up to a week. When eating them out of the refrigerator, allow 45 minutes to 1 hour for the apples to warm up before eating (the caramel is very hard out of the refrigerator). The apples can be eat on the stick or cut into segments. Those look like fun! I love how colourful they are! I’ve seen the candy corn type at the boardwalk on occasion. They are all very colorful! Now that’s an idea I can get behind. I love caramel apples this makes me want one right now. Whenever we go to Disneyland, the kids pick out the yummiest candy apples for themselves. I’m going to win some major mom points for being able to make them at home. I have had M&Ms on the caramel apples. I have never had candy corn. That’s a great idea! YUM! We love making candy apples this time of year. My husbands family has an orchard so we get a zillion apples. Right now I have bags and bags sitting on my table as today we start the process of making apple sauce, apple butter and cider. I think a few candy apples are in order for a treat! How lucky are you?! I would love that. We have one orchard where you can pick near by but we had an early hard freeze in November last year that took out their crop for this year. 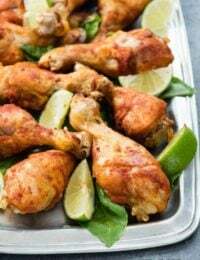 Oh wow… do those look good! 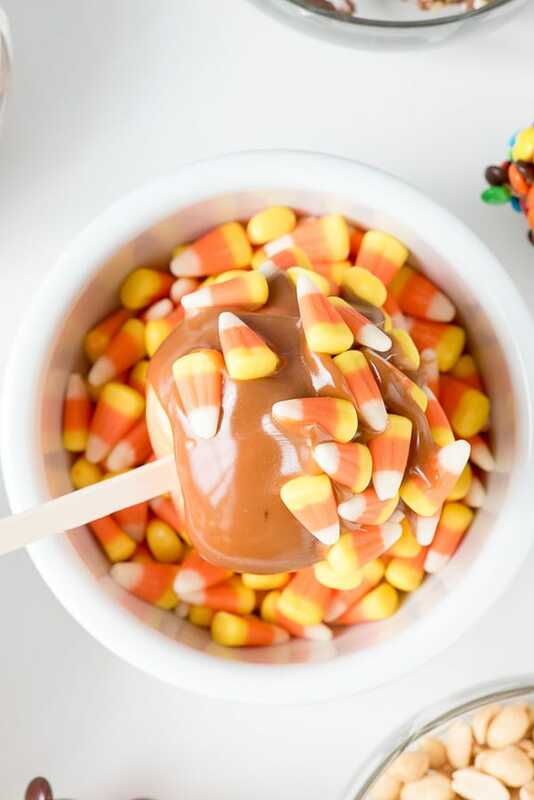 A fun treat for the fall season. Would be tough to decide if we should look at em or eat them because they look so decorative. This would be such a fun kid party activity! Maybe everyone gets to choose 2 toppings and they get their own bowl. Love it. They look so good, I’m going to try it sometime with my sister. These are great toppings for the apples. Great halloween treat. 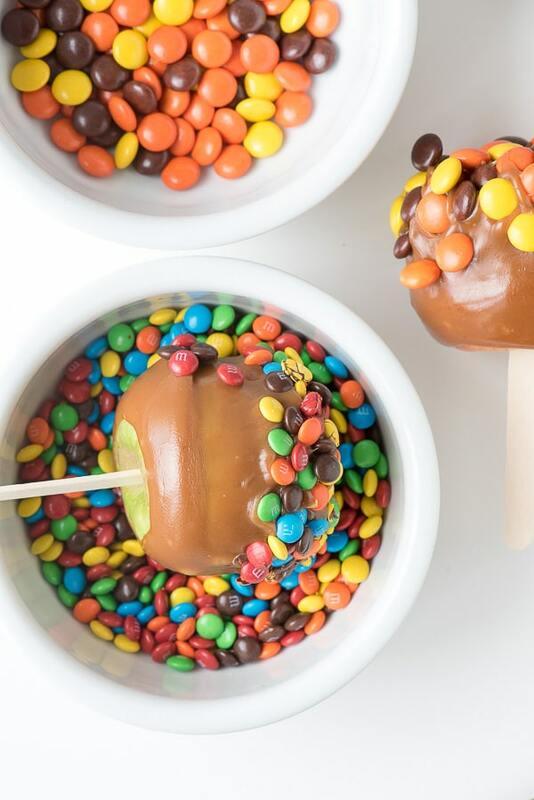 I love caramel apples but have never thought about making them myself. Thanks for sharing this, these are so festive! 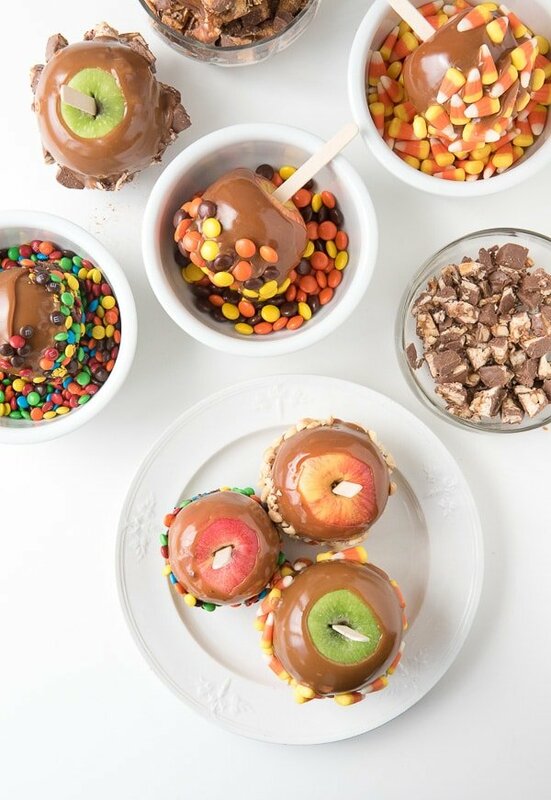 I love caramel apples and this idea of making each one unique looks like so much fun. I think I would definitely choose peanut butter cups for mine! Great ideas! I have all these ingredients in my pantry. I need to give these a try. These are the best caramel apples ever! I love the idea of covering them with Halloween candy. These looks delicious! 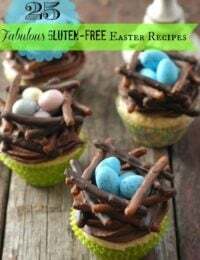 I will have to have my kids make them this week they would really enjoy it! 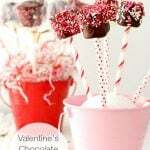 This is such a fun and yummy idea. I need to make some coated in candy corn . I love these! I have never had one with candy corns before, but NOM! Oh my, I’d probably break a tooth on those. But it would be so worth it! 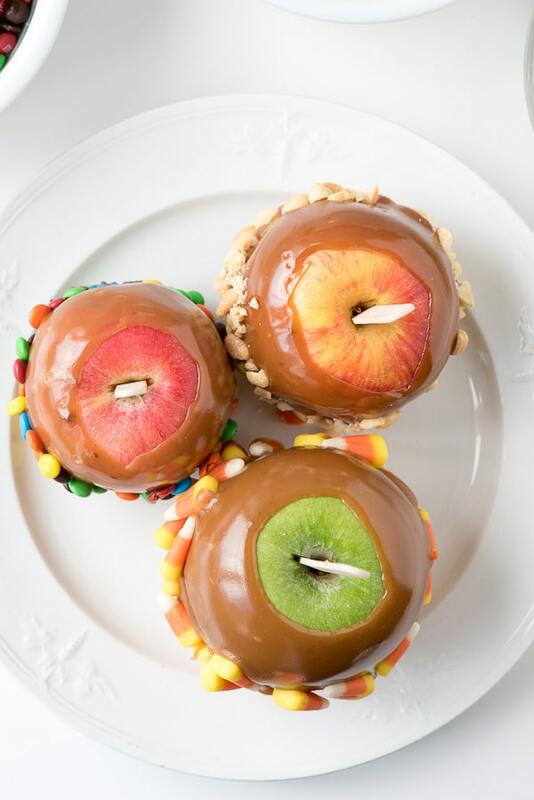 Seriously, how clever are these caramel apples?? So perfect for Halloween! 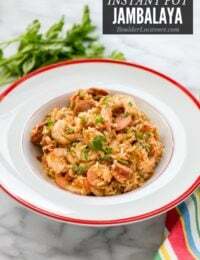 Thank you for sharing this amazing recipe! 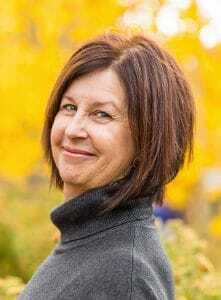 How fun Toni! I’m positive that kids of all ages would love these apples. I’m thinking that I want to be a kid at your house! My daughter’s school mates were pretty happy with the large containers of slices of them coming to school! 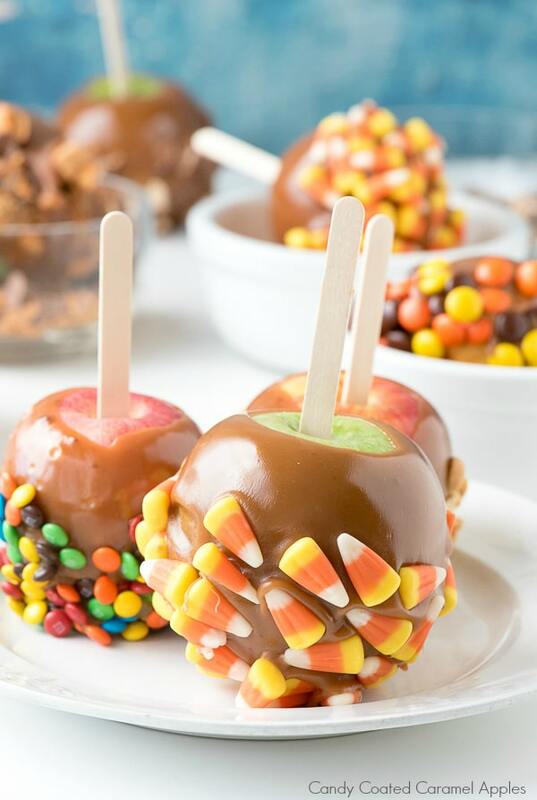 These are so much prettier than the typical caramel apple, with all the fall colors of the candies complementing the tawny caramel and green of the apple peeking through. A festive way to celebrate Halloween and colorful fall leaves.